Raspberries from the bushes outside our kitchen window, turned into jam last July. We hear all sorts of generalizations about U.S. farm policy. Some say U.S. farm programs are too stingy and should provide more help to farmers, especially small farmers. Others say U.S. farm programs are a boondoggle that just makes rich farmers richer. Still others say farm programs make consumers fat by encouraging too much cheap food. Instead of generalizing, it is important to think quantitatively. One good data source is the Producer Support Estimates (PSE) from the Organisation of Economic Cooperation and Development (a club for the world's upper-income countries). 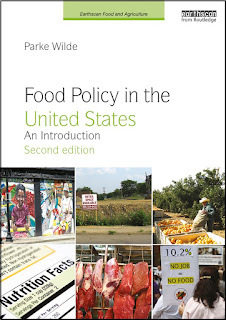 I use this data source in several chapters of my forthcoming book from Routledge/Earthscan called Food Policy in the United States: An Introduction. The PSE data measure diverse agricultural programs and policies in a consistent way across countries and over time. One problem with the PSE is that it can seem a little complex. To provide an orientation, Rebecca Nemec and I created the following data gadget. Nemec is a graduate student at the Friedman School at Tufts and the teaching assistant for my class on U.S. Food Policy. The top panel shows broad categories of support for agricultural producers. The bottom panel shows more detail about each broad category in turn. Just click on each colored broad category in the top panel to see the corresponding detail in the bottom panel. Working from top to bottom, we learn about trends in several major categories of producer support. Price supports and deficiency payments help farmers in years when prices are low. OECD worries about these programs because they distort international trade and hurt farmers overseas. Michael Pollan criticizes deficiency payments for making corn too cheap. Notice that in recent years -- with greater scarcity and higher prices -- these distorting policies have fallen to almost nothing under current policy. 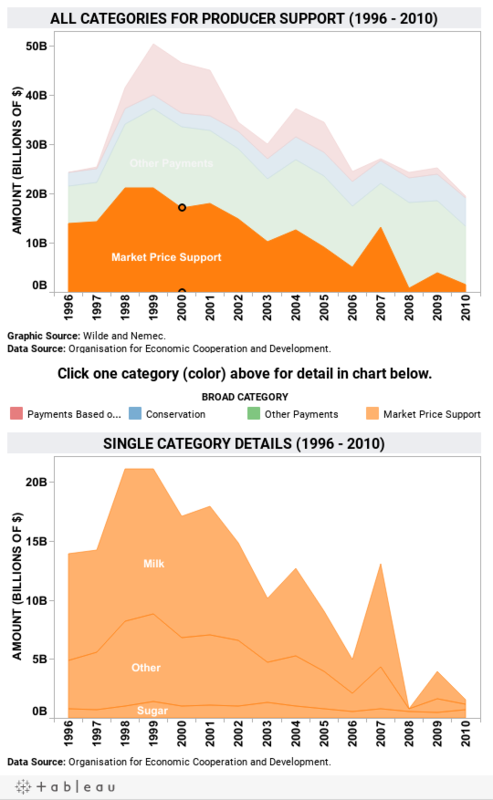 Conservation programs have been growing in recent years, and also do not respond to price fluctuations as wildly as deficiency payments do. The other payments category includes direct payments, which pay farmers regardless of the current price. These direct payments may end under some current farm bill proposals. They do not distort agricultural markets very much, but it is unpopular to pay farmers when they are prospering during high-price years. Market Price Support represents the economic impact of the trade barriers that protect some producers, especially for milk and sugar, from imports. Although they do not have a budget cost, these supports benefit farmers at the expense of consumers. As with deficiency payments, the impact of these trade barriers has declined to almost nothing in recent high-price years. trade policies that support farmers at the consumers' expense (the fourth broad category). To speak coherently about U.S. agricultural policy, one must make important distinctions across several types of programs and be aware of rapid changes in program impacts from one year to the next. There are a couple limitations that I should mention. First, the OECD data may have some limitations of their own. Second, while I did the best I could to classify programs from the OECD data into sensible categories, I did make some judgement calls about these program classifications. In general, U.S. support for farmers has been declining in recent years, mainly because of high food prices that result from greater scarcity on world markets. Though some people are more optimistic, I think population and environmental constraints may generally keep prices fairly high in the future. This means that governmental support for U.S. farmers can be smaller over time, unless legislators replace existing programs with new and poorly designed alternatives. For example, I worry about new and potentially expensive crop insurance programs that have been proposed in draft farm bills. The Johns Hopkins Center for a Livable Future and the Government Accountability Project have spent a couple years asking the Food and Drug Administration (FDA) to release information about the amount of antibiotic use in farm animals. Overuse of antibiotics in farm animals may lead to the evolution of more dangerous drug-resistant strains. FDA releases some summary data each year, but denied the request for more detailed tabulations,citing an exemption in freedom-of-information law that applies to commercial information and trade secrets. This seems wrong. Misuse of antibiotics is an important public health issue, and the aggregated data requested were not firm-specific. Since 2008, when the Animal Drug User Fee Act (ADUFA) began requiring drug companies to report basic information about antibiotic sales to FDA, the agency has released limited summaries of these data to the public. Sadly, though, the FDA conceals most of what gets reported by the drug companies. This concealment protects the producers and the drug companies, both of which make tidy profits from injudicious dosing of food animals. In the meantime, the Center's staff has done some clever sleuthing, exploiting a glitch in FDA's annual release of summary data, which was followed by a correction to the agency's numbers. The Center tracked down the source of the change in order to conjecture about the amount of antibiotics used in one particular category called arsenicals. I have been preparing home-made soft cheeses for the past couple years, working my way through the recipes in Ricki Carroll's book on Home Cheese Making. Here is a photograph of neufchatel curds draining in my kitchen last week. In a future post, I will tell about building a makeshift cheese press with my son this month at the holiday Craft Day, an inspiring Boston area tradition organized each year by Carolyn Mugar (who is executive director of Farm Aid). For more than a year, I had promised myself not to take up more arduous hard cheese making as a new hobby until I submitted a manuscript for my food policy book, but that goal was completed this fall. So this weekend, armed with the new press, I claimed my reward and began my first attempt at cheddar. Minor Update 12/13/2012: According to an NPR story by Adam Cole and Helen Thompson today, based on an article from Nature, the thread is even longer, connecting 7,000 years of kitchens! The Food and Drug Administration (FDA) has been missing the implementation deadlines that Congress set in 2009 as part of the landmark FDA Food Safety Modernization Act (FSMA). The sole remedy available for an unreasonable agency delay claim is for the court to compel agency action, such as by issuing an order requiring the agency to act, without directing the substantive content of the decision.... Although FDA has been unable to meet the aggressive statutory timelines for the seven new rules, there is no indication that Congress believed that strict adherence to those timetables is more important than careful consideration and development of these complex regulations to create an effective and modernized food safety system, provide clear guidance to the industry, and minimize later challenges or revisions to hastily adopted regulations. Accordingly, judicial intervention is not warranted at this time. There is a certain sad logic to this argument! The courts should mind their own business, because the only possible punishment is to order the very same achievements that FDA already is failing to achieve. I considered disputing FDA's claim about there being "no indication" of Congressional intentions for adherence to timetables. After all, Congress did write these timetables into law. On the other hand, Congress has not given FDA sufficient funding to meet all of its food safety objectives in the past year, and of course the next year looks even more bleak. Although food safety advocates are unimpressed with the agency's excuses, FDA really does seem justified in implying that Congress has sent mixed signals about prioritizing food safety implementation. I think we'll just have to be patient ... and go easy on the peanut butter. Tufts University's New Entry Sustainable Farming Project was covered this week in the Boston Globe, which described the project's matchmaking service connecting new farmers to both mentors and tillable land. New Entry uses GIS mapping data to screen for potential farm plots. The map sets contain a long list of criteria to distinguish individual parcels. For example, New Entry can filter the parcels based on size, ownership, zoned usage, and the quality of the soil. The system is so sophisticated it can pick out suburban homesteads with large patches of unused land, so New Entry was no longer limited to looking at obvious candidates, such as existing farms. The screenings are used to narrow the farmland hunt to the best candidates to approach about allowing use their land. Once New Entry identifies sites, it approaches agricultural officials in the towns involved to work with landowners interested in turning over property to farmers. See the project's website for an inspiring array of resources and training programs for both farmers (including a special focus on small-scale immigrant farmers in Massachusetts) and consumers. While labeling strategies provide a sound public policy response to some food ingredient dilemmas, in other cases it is simpler and more effective to make do without the ingredient altogether. Some argue that trans fats fall into the category of ingredients that should just be eliminated (with the exception of the small amount of trans fat that occurs naturally in animal food products). These fats replaced healthier traditional oils and fats just a few decades ago, and some countries have recently been rapidly shifting back away from their use without any major food system damage. In a commentary this week for the World Public Health Nutrition Association, Vivica Kraak, Uriyoán Colón-Ramos, and Rafael Monge-Rojas recommend a near-complete global ban on trans fats. This commentary presents a case for public health professionals, practitioners, academics, industry and government representatives, funders, public-interest non-governmental organisations and consumer advocates, to collaborate to support a global trans-fat ban. Coordinated actions to remove this harmful substance from our food and eating environments will be able to contribute to reducing chronic non-communicable disease mortality by 2025. 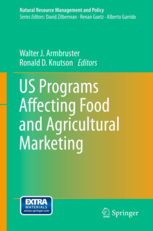 The new book edited by Walter Armbruster and Ronald Knutson is titled: US Programs Affecting Food and Agricultural Marketing (published by Springer). I have ordered it from my university library and look forward to reading it. It includes many chapter authors whose work is covered here from time to time. A theme appears to be that food policies may need to change over time, just as the private sector markets have been undergoing dramatic transformations over the years. USDA in October released results from its 2011 survey of certified organic production. Previously, the most recent such statistics came from a 2008 survey. The National Sustainable Agriculture Coalition explains how the survey results could be used to make crop insurance more accessible to organic producers. Carolyn Dimitri, who used to do economic research on organic agriculture for USDA, and who now teaches and blogs at New York University, summarizes the differences in methods and results from 2008 to 2011. The one sweeping generalization that I quickly reached is that the number of certified farms with sales declined between 2008 and 2011 for most, but not all of the commodity categories. At the same time, the value of sales increased for most categories, even for those with a decline in the number of farms. Several possible explanations come to mind: (1) farms exited the organic industry after 2008 because of the recession; (2) farms grew larger in terms of acres, which I can check (but haven’t yet); (3) the value of farm sales increased because prices farmers were paid increased, or because they were more productive, or a combination. 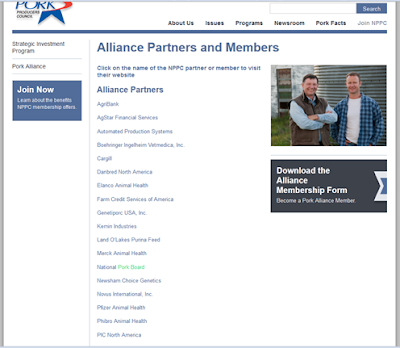 U.S. Food Policy reported on Wednesday that the National Pork Board (a federal checkoff program) was listed as an Alliance Partner on the website of the Pork Alliance, a lobbying entity sponsored by the National Pork Producers Council (a private-sector trade association). It is against the law for federal checkoff funds to be used for lobbying. I see today that the Pork Alliance website no longer lists the National Pork Board. The alliance must have removed the board from the list in the past 3 days, after a complaint was filed by the Humane Society of the United States. Here, for the historical record, is my screen capture from last Wednesday (click the image for a higher-resolution view). The National Pork Board appears right below Merck Animal Health. Recently, I was in the market for a good layperson's summary of the environmental impact of food choices. The one I liked best so far was the brief chapter on food late in the book How Bad Are Bananas? : The Carbon Footprint of Everything, by Mike Berners-Lee. Berners-Lee takes measurement seriously. At the same time, he is completely frank about how rough some measurements are. He doesn't waste time figuring out every last significant digit. Instead, he stays focused on the information that really matters for making sensible lifestyle choices. Berners-Lee has a talent for explaining technical material. As just one simple example, he has a delightfully clear explanation of a financial discount rate, an important concept for evaluating payback periods for investments (p. 188). Other authors might be tempted to skip the topic, but Berners-Lee recognizes that the layreader can understand this issue, without needing any equations. Go seasonal, avoiding hothouses and air freight. Help the store reduce waste. Buy misshapen fruit and vegetables. On related issues, I enjoyed seeing a presentation at the Friedman School's Wednesday seminar series last week by Susanne Freidberg from Dartmouth College, who spoke about Life Cycle Analysis (LCA). Her most recent book is Fresh: A Perishable History. Among other topics, Freidberg described the use of LCA in corporate sustainability initiatives, of which a leading example is Walmart's. Although a major retailer won't say "reduce meat and dairy" or "avoid excessive packaging," I nonetheless find the Walmart initiative interesting. Just for example, this video is blunt: "The raw truth is that the design of this system is unsustainable." And it provides a nice visual explanation of a food product's life cycle. The December issue of the Friedman School's graduate student publication, the Friedman Sprout, came out today. It includes articles on the local Slow Food chapter, how to survive a New England winter, craft ideas, and book reviews. I was interviewed for an article on the Prop 37 vote in California over GMO foods.